Bruce was Baptized in Wisconsin and confirmed in Hawaii, He attended nearly a dozen different schools in his youth while raised as “an Army brat” in Maryland, Wisconsin, Japan, Hawaii, Virginia, and Kentucky. After graduating from high school in Virginia, he completed his bachelor degree at Central Bible College in Missouri and in 1975 was admitted to Concordia Seminary in St. Louis. Bruce decided instead to join the Army as a medic. Six years later and now a lieutenant with a young family, the Army assigned him to an Infantry regiment in Alaska’s harsh sub-arctic interior. He served in several assignments for the next six and a half years while staying active in Christian activity as the Lutheran lay leader in the Delta/Fort Greely area. After thirty months living “outside” and then discharged from active duty, he brought his family up the Alaska Highway with a 27-foot U-Haul and Subaru wagon settling into cabin life in Big Delta on the Tanana River, not far from the Klondike and Yukon region. By 1992 Bruce helped establish Faith Lutheran Preschool and he became a charter member of the newly formed Denali Lutheran Church. Pastor Ken Schauer of the Alaska Mission for Christ recruited him as a volunteer to be trained as a licensed deacon for the Northwest District of Lutheran Church-Missouri Synod. In 1994 he was called and placed into ministry at St. Timothy’s Church in Tanacross. This mission was featured by Lutheran Witness in a cover article in 1996 and is discussed in Dr. Chris Reinke’s dissertation Sin Boldly. 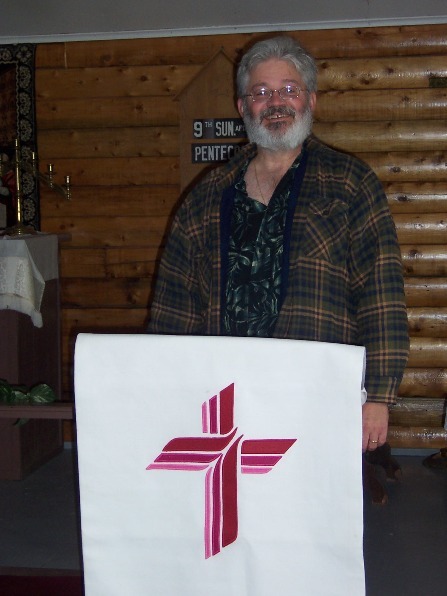 Thanks to the prayers, encouragement, and generous gifts of faithful supporters, Bruce has lead word & sacrament ministry and helped with innumerable Vacation Bible Schools in Athabascan villages of the upper Tanana River Valley for nearly twenty years. As a board member of the Alaska Mission for Christ, he has advocated tirelessly for rural and Alaska Native missions. Bruce considers his ministry of preaching in this wilderness his primary work. His commitment to Alaska Native families, their elders and friends, has been his joy. He calls his many jobs over the years in this frozen land with the military, private business, education, and now as a semi-retired contract weather observer “tent making.” The work pays the bills to make this ministry possible. He deems his greatest recent privilege has been to help usher St. Timothy’s Church at Tanacross into its second century of proclaiming the Gospel of Jesus Christ in the Last Frontier. Bruce has four adult children: Ben, Sarah, Elias, and Annie; and two grandchildren: Rafe and Scarlet.